American Angler jackpot winner Dr. Chong Chang, with Penn’s Jeff Ingram and trophy. What is the ultimate fishing trip? I just might be an 8-day “variety” trip in the September-October time frame, onboard a San Diego long range boat- just like the one that A group of PENN Fishing University anglers took last October aboard the 90-foot American Angler out of Fisherman’s landing, captained by longtime veteran skipper Sam Patella. 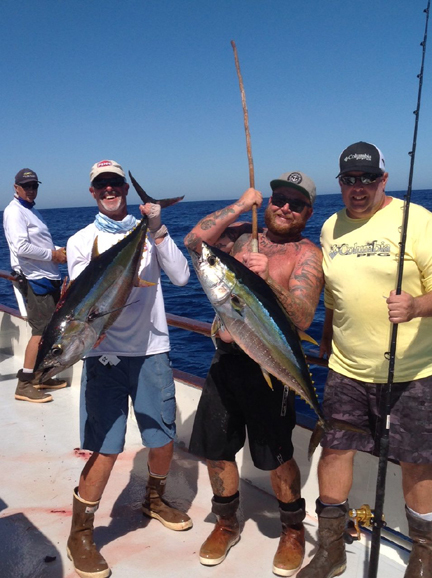 Although “cow” yellowfin tuna are not usually on menu on these variety trips, virtually everything else that swims in Baja waters may be encountered. In fact, almost all trips see not only the major game fish species, but at least one or two individuals that need to be carefully researched in a good fish ID book! The group was made up of anglers ranging from rank beginners to seasoned old salts. Some 10 of the 24 anglers were repeats from the previous year’s 8-day expedition. By the end of the trip, every single “wahoo rookie” had managed to land their first ‘hoo. Wahoo are usually the glamour species on 8-day variety trips. Good catches can be made anywhere from late July to early December, but mid-October is almost always “prime time”. Wahoo were definitely foremost on Captain Patella’s mind, as he made a beeline straight for Alijos Rocks after departing San Diego. 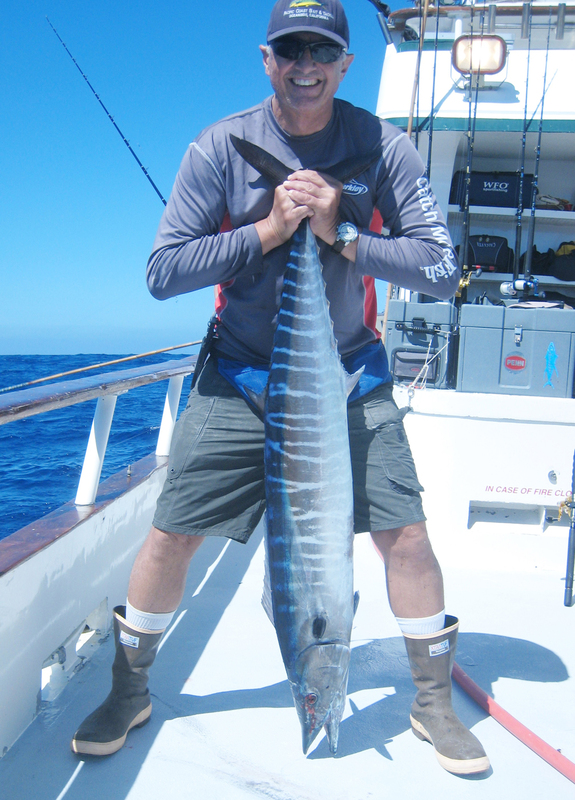 Within two minutes of arriving at Alijos and putting the trolling jigs in the water, the first wahoo strike occurred. Avid angler Sean Chong of Portland, OR was the lucky troller, and it was his first-ever wahoo to boot. After that it was hot and heavy, with red-hot action and numerous lost fish as is normal with wahoo fishing. When the smoke cleared after the first day of fishing, 54 wahoo were in the fish hold, and all but one of the anglers had tagged at least one. 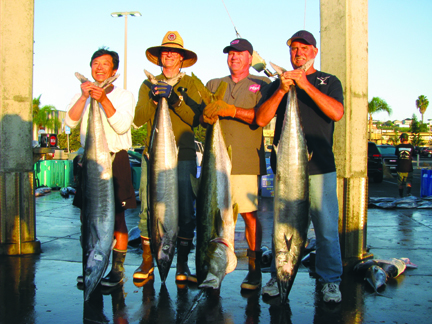 Productive wahoo lures included Tady 45 and Sumo 7X surface irons, along with KK Pono and Captain Jimmy Bombs. Live sardines were certainly a good choice, usually fished on 30-40-pound tackle, with an 18-24 inch singlestrand 40-pound wire leader and a size 2/0 Owner Gorilla hook. Some anglers tried a short length of 125-pound fluorocarbon with success, and a handful of lucky anglers managed to boat a wahoo on nothing but straight-tied 30-pound fluorocarbon. Captain Patella made a perfect move after two days at Alijos, and steered the American Angler to the Ridge. After a bit of expert looking around and maneuvering, Patella located a bunch of school-size yellowfin tuna that were ready to bite on almost anything. The 15-40 pounders eagerly hit on live sardines, along with numerous different jigs. Several anglers participated in tossing poppers, with Williamson Jet-Poppers and Popper-Pros in almost any color drawing spectacular bites. One more day at the Ridge saw more of the same on school-size tuna. Lurking among the tuna were a number of wahoo, with about 15 landed along with the tuna. Walt Bailey with a beautiful wahoo. Depending on the time of year, yellowtail may be caught almost anywhere an 8-day trip can reach, and at depths from the surface down to 350 feet. A wide variety of lures are effective, with blue/white Tady 4/0 jigs fast becoming the “default” choice for yo-yo fishing. Just about any live or even cut bait also works. The dropper loop rig is especially popular, and consists of heavy 50-80-pound tackle, a 12-16-ounce sinker, and a super strong 4/0-6/0 Owner Gorilla hook. With the emphasis on wahoo during this trip, only a handful of dorado were caught incidentally. During many 8-day trips, stopping on a floating kelp paddy can yield a literal bonanza of dorado, often of much larger grade than commonly seen closer to the border. When these conditions are encountered, limits of dorado in the 20-30-pound class are commonplace. Another species that is seen in widely varying numbers is striped marlin, and about 15 stripers were released during the PENN trip. Normally a “glamour” species under other circumstances, aboard long range boats they are not a target species, and are released. If marlin are present in large schools, a boat may actually have to relocate to find a higher percentage of tuna, wahoo, etc. Variety is indeed the name of the game, and this trip was no exception. Some 22-different species of fish were caught, and no doubt a few more were lost before making it to the boat. This trip logged yellowfin tuna, wahoo, bluefin tuna, yellowtail, striped marlin, sailfish, amberjack, skipjack tuna, dorado, black skipjack, white bonito, California bonito, hogfish, triggerfish, sheephead, whitefish, calico bass, starry rockfish, rudderfish, hammerhead shark, and even a jack crevalle, plus a garibaldi that was carefully released. Depending on the exact localities fished, and the vagaries of the fish gods, many additional species are commonly seen aboard fall 8-day variety trips. Commonly seen are several varieties of grouper, at least three different pargo species, common local species like barracuda and halibut, contrasted with exotic tropical visitors like rainbow runners, and of course huge number of different rockfish species, plus lingcod. Cedros Island stops may see the oversize gold spotted bass found there and almost nowhere else. Blue marlin, sharks and black seabass may be encountered too, but the crews do their best to avoid them, and work diligently on their release when hooked. Aquatic oddities pop up all the time; including snake mackerel, louvar, oilfish, spotted scorpionfish, rose threadfin bass, and my favorite- sarcastic fringehead. Somewhat rare, but nonetheless on the “possibles” list include bigeye tuna, kawkawa, and once in a blue moon, broadbill swordfish. School-size tuna like these were biting ferociously at the Ridge for the American Angler’s passengers. Many avid anglers may hesitate before signing on for an 8-day trip, thinking they don’t have the needed heavy tackle, or the necessary specialized skills. In reality, the skills most local anglers have, such as flylining baits to finicky fish, serve them even better aboard a long-range boat. Regarding the perception of the need for heavy tackle, the huge 50-wide size reels filled with 130-pound line used on longer trips are generally used only for trolling, and occasional kite fishing duty on 8-day trips. 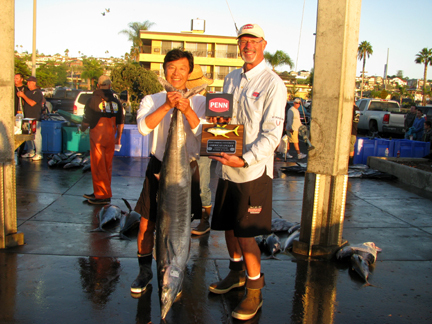 Lots of big fish were caught, and the official winners were: Overall Jackpot winner was Chong Chang with a 50.2-pound wahoo [he also had a 60.2 pounder caught trolling]. Chang took home a PENN Fathom 2-speed reel. Second and third place in the jackpot were Eric McKenna and Tom Kitli, with 49.0 and 48.6-pound wahoo. 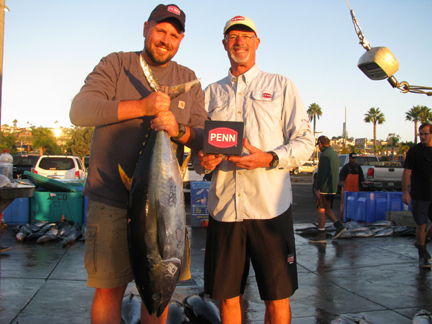 Largest yellowtail was a beautiful 48.4 pounder, which earned angler Steve Osborne a new PENN U.S. Senator US113N reel. Heaviest tuna was a 40.4-pound yellowfin, caught by Don Amboyer, and the “Hero Fish” was the amberjack caught by Eric McKenna, and Joe Bailey had the “Most Unusual” with a 15-pound jack crevalle.